Composite decks in Great Falls, VA are a smart investment in the durable quality and long-lasting performance of your outdoor living space. Made from recycled wood and plastic, composite decks in Great Falls, VA are not only an environmentally-friendly decking material, they are also super low-maintenance. And by mixing and coordinating decking materials in your deck design, you can still include woods, metals, or other suitable materials for your railings and decorative aspects of your composite deck. Since composite decks contain no wood preservatives they are completely resistant to water damage and decay, molds and fungus, and insect damage. 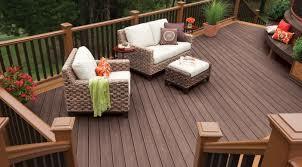 Composite decks in Great Falls, VA never need painting or staining. Simply sweep and wash its waterproof surface with a garden hose several times a year, and your composite deck will look brand new. While composite decking typically requires a greater up-front investment than hardwood, composite decks in Great Falls pay for themselves over the years in reduced maintenance and a significantly longer service life. Composite decks in Great Falls, VA, are often selected for their chemically-engineered resistance to cracking, splitting, and weathering so common with wood decks. Reputable manufacturers such as Trex, CertainTeed, and Timbertech claim their composite decks can last up to 30 years without any composite board replacement. According to the experts at This Old House, the average lifespan of a comparable wood deck is only 15 years. With immense value and appeal, composite decks in Great Falls, VA continue to increase in popularity. To explore the design and installation of composite decks in Great Falls, VA, contact the deck experts at Hal Co, where our success comes from your complete satisfaction. This entry was posted on Monday, July 14th, 2014 at 3:40 pm	and is filed under composite deck, Decks. You can follow any responses to this entry through the RSS 2.0 feed. Both comments and pings are currently closed.